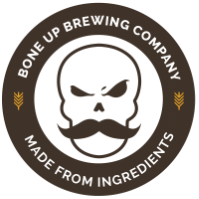 Stats: Doyle - Bone Up Brewing Co. Cheese Pairing: A big ol' slice of fresh mozzarella. Music Pairing (Jared's Choice): That song by The Misfits (the original members) that's all like "Whoooaaa-oooohhh-oh whoa-oooohhhh oh whhooooooaaaa"
Best Occasion to Drink: While riding a wolf. Brewers' Notes: Hot on the heels of our last "Misfit hop" beer (which was Danzig, by the way), we're clearin' all corners of our hop freezer and you get to reap the hoppy benefits! We whipped up a strong-as-heck Brutal IPA to befit this beer's namesake, only then to realize we probably could have made a "legacy of brutality" joke in the title except that we already used all our Legacy hops. Anyway, this beer is delicious and you should drink it!